My sweet friend Kayla Grey has been dear to me since she met her husband-to-be at Probe Ministries’ Mind Games camp several years ago, where I get to teach. It has been a joy to walk with this wise, smart, loving, godly young woman as she married and had her (first) two sons, the second of whom had a difficult delivery and spent nine hard, hard days in NICU. I loved this post on her blog Renown and Crowned so much I asked if I could share it here. The overwhelming nature of the neonatal intensive care unit (NICU) can paralyze even the most organized families. Suddenly you are living a life you never planned, and since you didn’t plan to live this way, figuring out what you need becomes a daunting task in and of itself. In our experience, we wanted to be able to say, “This is how you can help!” — but we didn’t even know where to start. We didn’t spend a huge amount of time at the hospital until about day 4, and we didn’t really have an idea of how quickly Trooper would come home until then. It was hard to know what to ask for at the beginning. As the week progressed, we became more aware of what would help us in our situation. If you’re looking for ways to help a NICU family, here are some ideas to consider. Note: Because each family has different dynamics, these will not all apply to everyone. If you aren’t sure whether one of these ideas would truly help the family you’re ministering to, be sure to ask them. Journal and pen — I found out quickly how the days blended together in my memory, and I wanted to record the journey for recollection later. My sister also suggested using a journal to write down what doctors and nurses reported when, so you would have a written record if you were getting 2 or 3 differing opinions. Gift cards — Sometimes you just need to get out of the hospital. Sometimes you need a bite to eat that isn’t cafeteria food. And sometimes you need “food” that will get you through the transition-to-home stage. Gift cards for grocery stores can also be helpful. Gas cards — Particularly if the family has a decent commute to the hospital, gas cards can ease any budgetary concerns that might play into the frequency of their visits. Bags of snacks — One family gifted us with 3 large sacks of snacks and breakfast foods. This was so helpful for us, especially on the days we forgot to eat a “real” meal because of logistics or meetings. Note: Be sure to check with the family to see about any food allergies. In-home meals — It amazed me how one meal being brought in could free up so much mental power. Plus, if the meal was large enough, there could be leftovers for another meal or two! Activity bags — Hospital waiting rooms can be rather difficult for older siblings. A new coloring book, play-dough, or a puzzle could be a welcome diversion from the mundane. Visiting with, listening to, praying with them — We all have a story to tell . . . and sometimes, telling someone who’s “outside” of the emotion and doctors’ orders begins the process of renewal and recounting God’s goodness, even in the NICU world. Even if you can’t fully relate to where the family is experiencing, listening is a huge help. Older child care — Is there an older sibling who’s stuck in the midst of back-and-forth? Spending an hour reading books or coloring can allow Mom and Dad to sit with the littlest child . . . . together. Fill their freezer — Figuring out what to cook after arriving home can be an unnecessary source of stress. Prepare (or buy) some casseroles to be frozen. This way, the family can use them as slowly or quickly as needed. Are you long distance from the family in need? You can help, too! Snacks from Amazon or Walmart.com — Let the technology of the Internet do some of the work for you! If there is a Walmart near the hospital, you can select snacks (or even microwaveable meals! ), purchase them online, and have them “shipped” Site to Store. The family could then send someone to pick up those items, without paying a penny. Amazon, on the other hand, can be a bit more pricey, but you can have more obscure snacks or groceries sent straight to their home. Practical needs — By the same token, paper goods can come in handy when the transition-to-home takes place. Paper plates, paper towels, toilet paper, and the list goes on. . . . . You can help keep the family well stocked so they don’t have to make a midnight run for toilet paper. Your turn: If you have experienced the NICU world, what was the best help you received? What would you suggest NICU families ask for when the “How can I help” question arises? 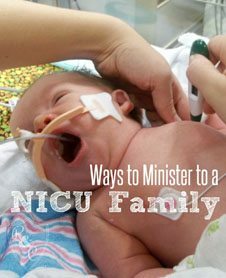 This blog post originally appeared at blogs.bible.org/engage/sue_bohlin/ways_to_minister_to_a_nicu_family on Nov. 3, 2015.